Stand out against the competition with impressive plastic business cards. Handing out plastic business cards at a trade show or meeting will immediately impress your clients. Our premium plastic is sleek upon first glance and instantly stands out against dull looking and flimsy paper. We do all our plastic business card printing on a material that is durable, waterproof, and tearproof. With a 20 pt. thickness that’s sturdier than other PVC business cards but slightly thinner than a credit card, we provide products that last years but are still easy to carry around. White plastic is our standard plastic business card that provides an opaque background for your design. **Design Note:** We recommend printing on both sides to highlight your company logo, name, and information. Frosted plastic business cards have a semi-transparent appearance. ***Design Note:** Use a font size at 8 pt. or higher so all information remains readable. Strokes or lines shouldn’t be thinner than 1.5 pt to keep the design easy on the eyes. Clear plastic business cards are transparent on both sides. ***Design Note:** Text or images in white will appear clear on the card itself, so use colors that complement the background. Fonts should be no smaller than 8 pt. and strokes or lines above 1.5 pt. All transparent plastic business cards come with a peel-off plastic film to protect them from damage during shipping. Create business cards in the standard rectangle or square shape. Both come with rounded corners to keep the card handy and easy to fit into a wallet. We recommend choosing the 3.375” x 2.125” size out of the four available sizes for a rectangle design, which are the same dimensions as a credit card. We also offer an oval for designs that aspire to distinguish themselves from the competition. Print plastic business cards with us today. Our friendly print experts are waiting to help you get started on your order. What happens when I have white ink or color on my plastic business card design? All white areas on your design will appear either clear, frosted, or white, depending on your choice of plastic material. Since the material is meant to highlight your company information and logo, we recommend using dark or bold colors to utilize our full color printing and to contrast the plastic material. Can I apply sequential numbering, variable printing, and magnetic strips on the plastic card? No, we don’t offer these features for plastic business cards. But you can utilize our plastic materials to design luxurious promotional tools like discount or loyalty cards for your customers. Our plastic business card templates will help you design your cards. Use these templates to make sure you set the right layout before you submit your design for proofing. Your business card printing should produce a design that surpasses a potential client or customer’s expectations. Thankfully our clear, frosted, and plastic materials get you started with their durable and distinct looking finishes. They will feel guilty for ignoring and throwing your premium design. Keep these tips in mind when you create business cards. Clear plastic business cards provide unique ways to visually convey your product or service. Having the entire card completely transparent easily brings attention to your logo and company name. The clear plastic can also represent an element of your business’ service. For instance, photographers can have the plastic appear to be their viewfinder. Some businesses also use the transparent background to highlight what they do. Imagine the clear plastic appearing like a window or as part of a car for a cleaning service. Frosted plastic is not completely see-through. 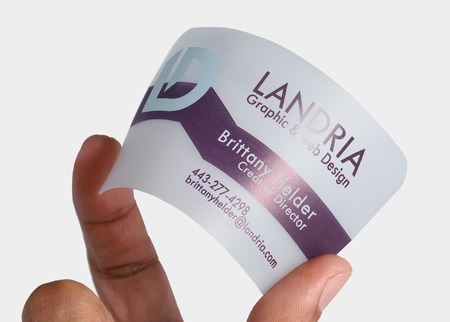 Its texture is semi-transparent, providing more space for images, colors, shapes, and other information on one or both sides of the business card. Since we offer full color printing, bright and bold hues appear more vivid against the translucent plastic background. Stand out with a saturated finish and contrast the white plastic’s opaque background with bold hues like red or dark colors such as black and navy. Avoid light, pastel colors that will be washed out in the background. You could also utilize the opaque finish with a minimalist design composed only of company name and contact details. This keeps the focus on important information for easy reference. Take advantage of the possibilities and material durability when you opt for plastic business card printing. It all starts with that daring design.